Our Foundation was born in the heart of Grupo Catalana Occidente in 1998 with the purpose of channeling the sponsorship and patronage activities that the insurance company had been carrying out throughout an entire century. Its original name —Fundación Catalana Occidente— was replaced by the current one, Fundación Jesús Serra, in 2006, as a tribute to the figure Jesús Serra Santamans, founder of the company and a firm defender, from the private sphere, of humanitarian values and spirit to the benefit of the community. In this new era, our Foundation follows the path of its proponent and yearly promotes a large number of research and educational projects, cultural activities, sport activities, and solidarity initiatives, both organized by the Foundation itself and also organized in collaboration with other institutions, with the aim of fostering Grupo Catalana Occidente's work and commitment towards society. Among the different projects carried out, the ones that stand out are those that focus on improving the talents of children with no resources through musical initiatives such as “My Turn” or the scholarship programs in entities such as the Deusto Business School, the Fundación ESADE or África Digna, in Kenya; those aimed at promoting poetry, especially among young people, through our yearly poetry competition; those that focus on supporting research and its dissemination through activities such as the Fundación Jesús Serra Research Award or the sponsorship of initiatives aimed at young disabled people, such as university education or entrepreneurship programs coordinated with the Fundación Prevent; supporting the musical career of the winners of the Maria Canals International Music Competition; organizing adapted sport meetings, together with the FEDDF, with the aim of raising awareness in young people on the difficulties faced by disabled people or the carrying out of sports activities for disabled relatives of employees and mediators of Grupo Catalana Occidente, as well as collaborating with social assistance organizations such as Doctors Without Borders, Manos Unidas, or Balia Foundation. 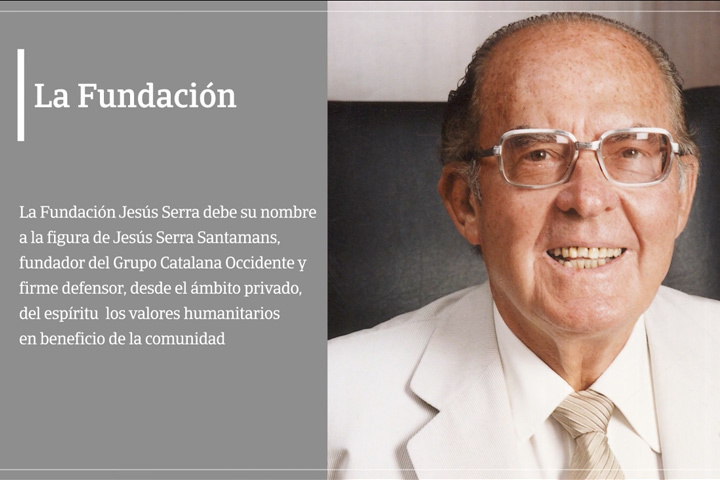 Our Foundation works towards helping achieve a better society for all, while always guided by firmly held values such as solidarity, effort, and teamwork, which care inspired by the humanitarian conscience that characterized Jesús Serra Santamans: the founder of Grupo Catalana Occidente. The human and entrepreneurial spirit of our founder has led us to promote a large number of projects year after year, among which are included research programs, cultural activities, and sports tournaments, as well as other activities where scholarships are provided for studies and a large number of social initiatives are aimed at integration, the promotion of human rights, and progress. Among the organizations our Foundation supports are Spanish National Center for Cardiovascular Research (Centro Nacional de Investigaciones Cardiovasculares, CNIC),, Spanish National Cancer Research Centre (Centro Nacional de Investigaciones Oncológicas, CNIO),, the Fundación ESADE, Spanish Sports Federation for Persons with Physical Disabilities (Federación Española de Deportes de Personas con Discapacidad Física,FEDDF), (Adapted Winter Sports Center (Centro de Deportes de Invierno Adaptados,CDIA), Manos Unidas, Doctors Without Borders, Fundación Prevent, and the Spanish Federation of Food Banks (Banco de Alimentos). Our future plans, which are constantly growing, reflect the continuity of our work as sponsors of significant initiatives aimed at several collectives, the development of new projects, and the extension of the scope of action to other social initiatives that, at least, bring a smile to those most in need. The pillars of Grupo Catalana Occidente have been laid upon the incorporation in 1864 of the Sociedad Catalana de Seguros Contra Incendios a Prima Fija. In its first years, over 150 years ago, the company grew strongly up to the 50’s, which is an indisputable achievement if we take into consideration the complexity of that period's context, a turbulent period of wars and changes. However, the company really took off well into the 20th century under the leadership and entrepreneurial vision of Jesús Serra Santamans, who expanded the Group across Spain by broadening its scope of action and extending its range of products, aimed at covering the needs of families and companies. It is currently one of the largest insurance companies in our country, with an extensive experience, historical and proven solvency, and coherent and profitable management. In addition, it is listed on the stock exchange and its holding includes companies as significant as Atradius, which operates in almost forty countries. Grupo Catalana Occidente has consolidated itself as one of the leaders in the Spanish insurance industry and in credit insurance worldwide. With steady growth and vast implementation, it has over 7,000 employees, a presence in more than 50 countries, and serves more than 4 million customers. Its network consists of over 1,600 offices and 19,000 mediators. It currently holds the sixth position in the Spanish market and the second position in credit insurance worldwide. For further information about the products and services offered by Grupo Catalana Occidente, visit its website at: www.grupocatalanaoccidente.com. Jesús Serra is mainly known for having founded Grupo Catalana Occidente and having dedicated his professional life to the world of insurance, becoming one of the most important personalities in this sector in Spain. A man of extraordinary business talent, besides Grupo Catalana Occidente he also founded other important companies and institutions during his extensive career, and he spearheaded multiple projects to which he always contributed a positive and visionary spirit that made him worthy of numerous awards. Throughout his life, he maintained a special interest for the arts (pursuing music and poetry with passion)and for sports, which he not only participated in but also actively promoted through various initiatives. However, if there was one thing that characterized him, it was his great humanitarian spirit, with a particular affiliation for those most in need. This trait was reflected in the intense social work that was always present throughout both his professional and personal life. Here at the Foundation, we keep his social work alive through the various educational, artistic, sporting, social, and research projects we pursue.